Providing you the best range of die punch cabinet with effective & timely delivery. 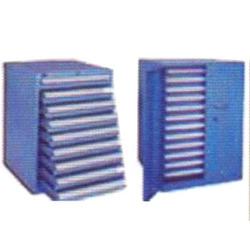 Mastech Machinery is the preferred name in the industry that manufactures, exports and supplies Die Punch Cabinet. Known for their tough construction, longer operational life and smooth finishing, these lightweight cabinets are massively popular among our valuable customers. Die punch cabinets offered by us are examined for their flawlessness before the final dispatch.